Martin Howard has written a paean to "eccentrics" — the lobster-walking, mole-eating, own-buttcheek-caressing weirdos who, he argues, make the world a better place. Which made us think of our favorite eccentrics — and what eccentricity is in the first place. It's a little hard to take seriously an article that begins, "If we ever meet, you might notice my hand slip down the back of my trousers to caress my buttocks." But not taking things too seriously may be part of Howard's point. He writes of "Grade-A loons" like Oscar Wilde, who used to take a lobster for walks, and the Reverend William Buckland, who "famously attempted to eat his way through the entire animal kingdom (he reported that moles and bluebottles taste vile, should you ever be tempted by a tasting menu)." Digging into the research of psychiatrist David Weeks, he finds that the eccentric (Weeks's examples included a man who only walked backwards) had less mental illness than more normal people, and were less likely to suffer from addiction. So perhaps cat ladies aren't crazy after all. Weeks also advanced the theory that "like the occasional mutations that drive evolution, eccentrics may provide the unusual, untried ideas that allow human societies to progress." And indeed, the reference to progress is apt — plenty of people are branded as eccentric not because they eat moles or grab their own butts but simply because they live in ways that aren't yet accepted in the mainstream (like, say, being a single woman and having cats). Others consciously stir the pot, periodically splashing their inspiration onto the normals who gather round to gawk. And sometimes it's hard to tell the difference. Lady Gaga seems solidly in the conscious-kook camp. 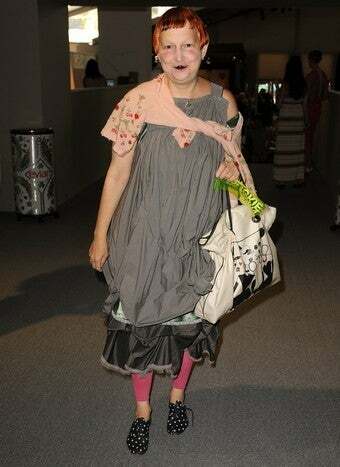 But what of Sadie's girl-crush Lynn Yaeger (pictured), known for her odd makeup and a hairstyle she describes as "the world's oldest French orphan?" What of Tilda Swinton, featured in Simon Doonan's book Eccentric Glamour for her sometimes bat-like getups. What of Doonan himself, who has decried the lack of "experimentation" in celeb fashion? Fashion is a very visible avenue of eccentricity, but art — think Salvador Dali — and literature — Shirley Jackson and Doris Lessing, perhaps — have also had their share of oddballs. But sometimes the most influential eccentrics are those we know personally. Sadie mentions her grandfather: "Sheds, gold buried under the house, an obsession with 'final-sale discount' supermarkets, a penchant for gluing in his teeth and flights suits, an insistence on celebrating Christmas a week late...Oh, I could go on!" And when I finished Howard's piece, I thought of the cat ladies I knew, a pair who lived on my street growing up, owned thirteen cats between them, and once deputized me to coax their giant marmalade tom out of a hole in someone's chimney. Then I realized I couldn't remember them ever doing anything very odd — certainly no lobster-walking — but that nine-year-old me simply assumed they were weird because they had a lot of pets. In fact, maybe the real lesson of eccentricity is that it's in the eye of the beholder — that excepting the clearly orchestrated antics of the Gagas and Dalis of the world, most people lead lives that, for them, feel normal. And insofar as the visibly offbeat have something to "teach us" (presumably they also have plenty to do themselves), it may be that the range of human experience is wider than any one person's limited imagination.